The Hoffman House story begins in 1861 when Chicago tobacconist and industry pioneer Edward Hoffman blended the finest tobaccos available into an exquisite cigar. He packaged them in beautiful boxes featuring Bouguereau's titillating painting "Nymphs and Satyr." 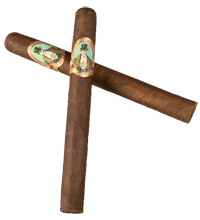 A bit scandalous, perhaps, but it certainly attracted people to this very fine cigar. However, it was the cigar which brought smokers back. In 1898, Mr. Hoffman sold the brand to a larger manufacturer. 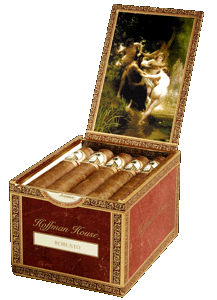 Well into the 1920s, Hoffman House cigars enjoyed immense popularity. Alas, over the years, the nymphs were clothed and the cigar faded into the past. In 2006, Hoffman House made its triumphant return. Rich and complex, with a refined balance, each puff of this storied cigar is a celebration of the finest tobaccos. A dark, oily sun-grown Ecuadorian wrapper surrounds a rich Dominican binder and sumptuous blend of Nicaraguan and Peruvian filler leaves.